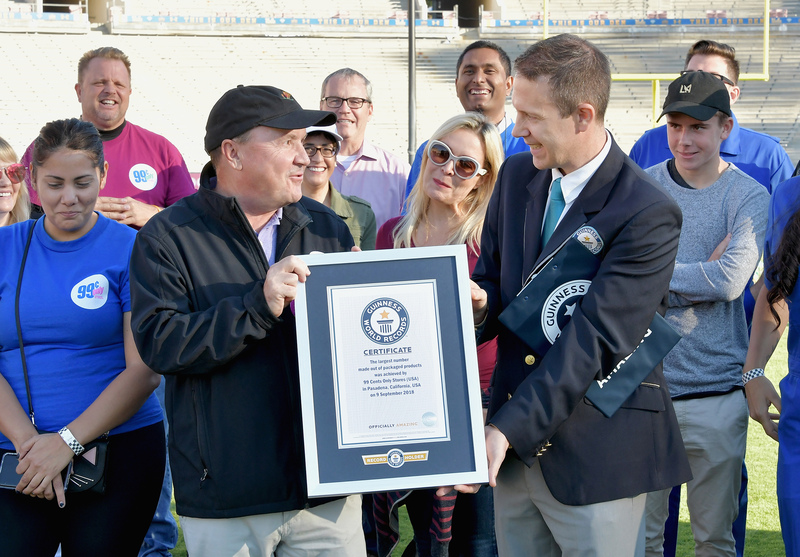 The value-driven chain used over 12,000 products to create the display in less than 24 hours at the world-famous Rose Bowl Stadium in Pasadena, Calif.
CITY OF COMMERCE, Calif., Sept. 10, 2018 /PRNewswire/ -- Today, 99 Cents Only Stores celebrates their latest feat of becoming the GUINNESS WORLD RECORDS title holder for the Largest packaged product number. 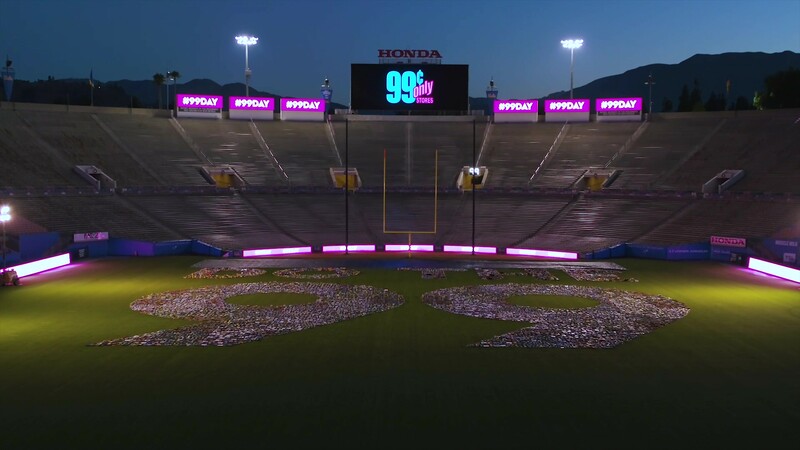 In a fast-moving production that took less than 24 hours, 100 people and over 12,000 products on the field of the Rose Bowl Stadium in Pasadena, Calif., the retailer created a gigantic 18,200 square foot "99" display in celebration of their inaugural #99Day customer appreciation event. As the sun rose above the world-famous stadium in the most picturesque scene, a GUINNESS WORLD RECORDS adjudicator verified the GUINNESS WORLD RECORDS title and presented the 99 Cents Only Stores with the official certification for the Largest packaged product number. 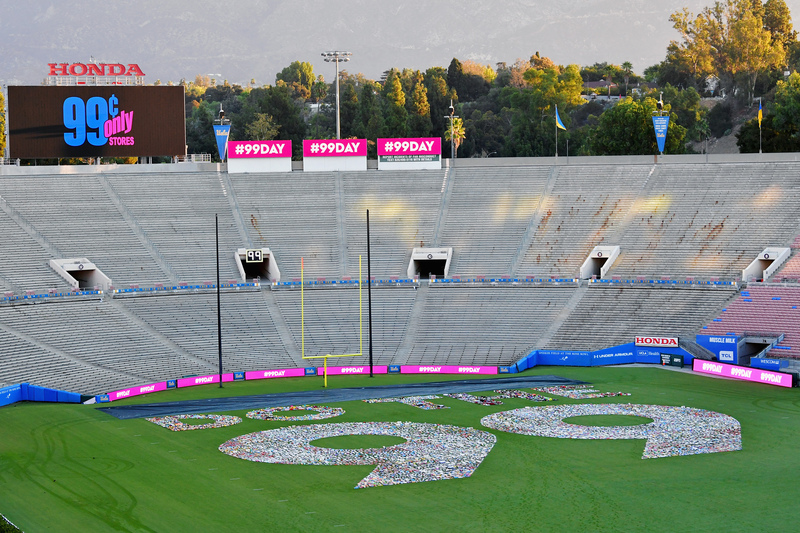 The Guinness World Records title for the Largest packaged product number was set by the 99 Cents Only Stores in under 24 hours, with over 100 people at the Rose Bowl Stadium Field on Sept. 9 for #99Day. The completed 99 display set a Guinness World Records title for Largest packaged product number. 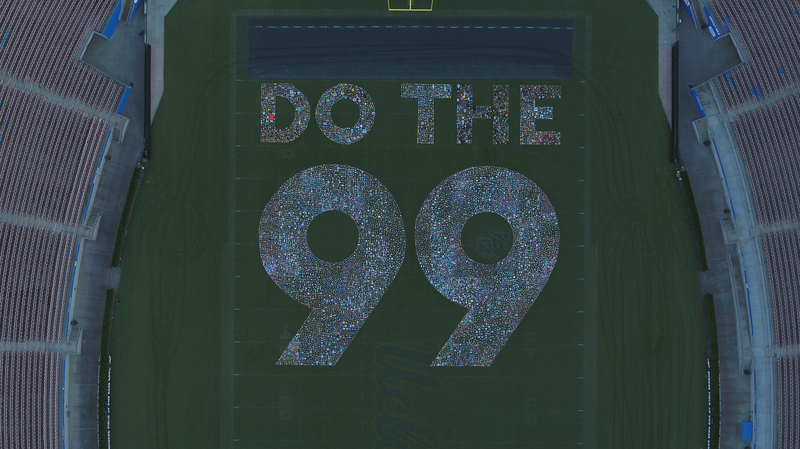 This record was set at sunrise at the Rose Bowl Stadium Field with over 12,000 products from 99 Cents Only Stores on #99Day. Guinness World Records Adjudicator Philip Robertson (R) presents CEO of 99 Cents Only Stores Jack Sinclair with the certificate for Largest packaged product number at the Rose Bowl Stadium on Sept. 9, 2018 in Pasadena, California. 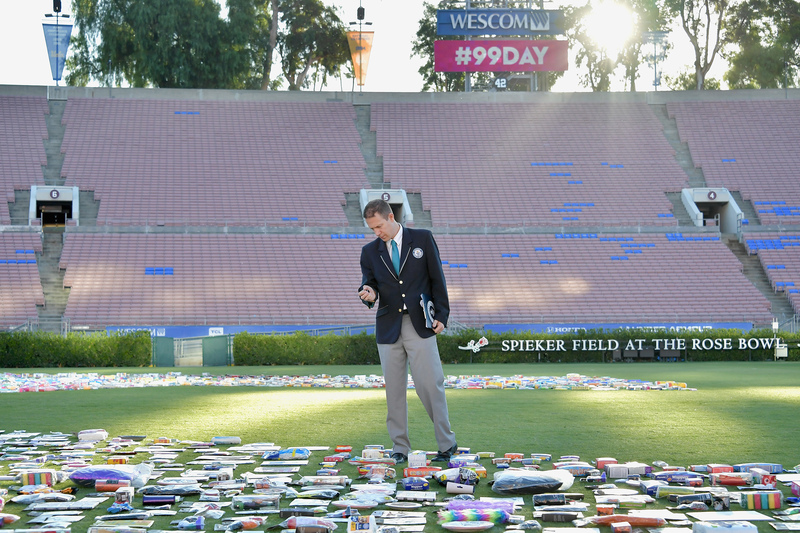 Guinness World Records Adjudicator Philip Robertson counts the final numbers for the 99 Cents Only Stores Guinness World Record title of Largest packaged product number at the Rose Bowl Stadium on Sept. 9, 2018 in Pasadena, California. "We wanted to showcase the types of brand names, fresh produce, and seasonal products available at the 99 in a big way – and what bigger way is there than setting a GUINNESS WORLD RECORDS title," said Jack Sinclair, CEO of 99 Cents Only Stores. "Everyone deserves extreme value and we're thrilled to be part of this unique occasion, giving back to the community, and celebrating our customers." The Officially Amazing™ display included the wide range of merchandise available at the 99 Cents Only Stores, such as cleaning supplies, home goods, pet food, snacks, drinks, cosmetics and more. To set the bar even higher, 99 Cents Only Stores also added 2,500 products to create their well-known slogan "Do the 99" (added products not included in the GUINNESS WORLD RECORDS title attempt). To make sure the items were put to good use, all $20,000 worth of product was donated to the LA Food Bank, School on Wheels, Alleviate Skid Row, the Los Angeles Boys and Girls Club and Goodwill Southern California after the successful completion of the GUINNESS WORLD RECORDS title attempt. Please visit Dothe99.com/99Day to learn more about how the 99 Cents Only Stores celebrated #99Day.